Have you ever traveled to a foreign country just by reading a book? I'm sure you have. What about a cookbook? 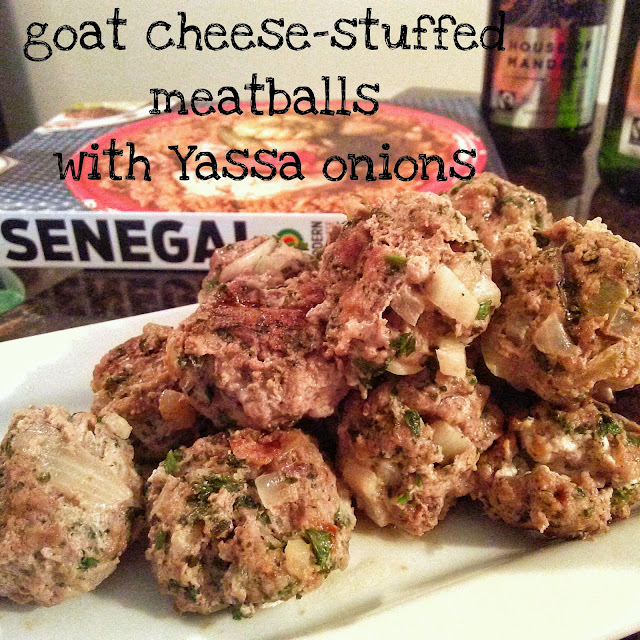 I combined two recipes into one to create the ultimate recipe: Goat cheese stuffed lamb meatballs with Yassa onions. I love lamb and I couldn't resist sharing a old, yet new twist on Senegalese cooking. These meatballs are paired with The House of Mandela Wine. That's right. The House. Of. Mandela. Nelson Mandela. These are fair trade wines produced by the granddaughter and daughter of Nelson Mandela. The wines are meant to be enjoyed with food and I can think of no better time than the week long holiday celebration of Kwanzaa. The House of Mandela Chardonnay pairs perfectly with the meatballs. The tang of the citrus and the onions of the meat are the perfect foil to the buttery notes of the wine. Another acceptable pairing would be the comparable cabernet sauvignon. Pierre Thiam is a chef, restaurateur, and cookbook author. He was raised in the capital city: Dakar, Senegal, a bustling and culturally diverse metropolis on the west coast of Africa. This cookbook and most everything in it remind me of my ex-husband who was from Senegal. I have talked about our kitchen and how it influenced my cooking style in the past. Fast-forward nearly 10 years and I've been transported to the center of Senegalese food culture and its people. I never made it to Dakar as a tourist, but it's definitely on my bucket list. The colors, the people, the beauty, the exotic expectations... I'm definitely planning for a bucket list excursion. Senegal has a vibrant, diverse food scene that boasts a rich, multifaceted cuisine. If it's not freshly caught fish it's a flavorful stew full of succulent accompanied by super healthy ancient grains and leafy greens. Fresh, bright and fiery are the words I'd use to describe the depth of Senegalese cooking. The recipes are Pierre’s own creative, modern takes on the traditional Senegalese dishes. And below you'll find mine! Place the lamb in a large bowl and add garlic, onion, lime zest, lime juice, parsley, cilantro, mint, salt, cayenne, cumin, and egg. Mix until well blended. Tightly cover and refrigerate for at least an hour, up to 24 hours, to let the flavors meld. Using your hands, make a round meatball the size of a golf ball, then slightly flatten it into a disk. Pit a pinch of goat cheese in the center and carefully wrap the meat around it, gently reshaping it into a ball. Repeat until all meatballs are filled with goat cheese. Refrigerate until you're ready to cook. Grill the meatballs or place them on a baking sheet to broil. Cook, turning a few times, until all sides are browned, 7 to 8 minutes. Serve immediately with the yassa onions. Heat the oil in a cast-iron skillet over medium heat. Add the onions and bay leaf and stir well to coat the onions with oil. Season with salt and pepper. Cover and cook undisturbed for 10-15 minutes, until soft. Add mustard and stir well. Adjust seasoning, if necessary, raise the heat to medium-high. Cook the onions uncovered for another 10 minutes more, stirring to avoid scorching, until the onions are a nice golden brown. Remove bay leaf. Serve with goat cheese stuffed lamb meatballs. Oh my! these meatballs sound exquisite ...goat cheese? love! + thanks for the wine pairing ideas! Love that you combined two recipes into one. I made lamb meatballs once and this is a reminder I need to make them again! My husband ate lamb meatballs recently at a friend's house recently and begged me to make them! Wait until I surprise him with these GOAT CHEESE meatballs! I love lamb too and these lamb meatballs stuffed with goat cheese sound like heaven to me! I can't wait to try your recipe and pour myself a nice glass of wine! 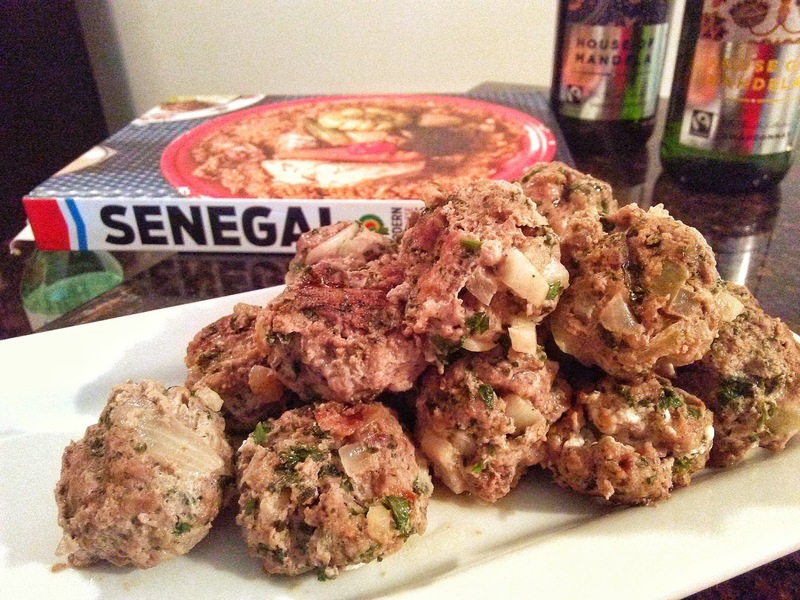 I'm totally intrigued by Senegalese cooking. I don't know anything about it so this recipe is going on the list!! These meatballs look superb! Also, the wine? Hello? That's an interesting choice and I bet a huge conversation piece at any dinner party! I bet that these lamb meatballs are amazing. I love lamb but I've never made meatballs with it!